As any sports rights holder knows, those rights come with a lot of moneymaking potential. MTV Oy (not to be confused with MTV, the music television), Finlands largest commercial broadcaster has exclusive rights to broadcast the Finnish national team ice hockey matches in Finland. The matches are broadcasted on MTVs largest TV channel, MTV3 and on MTVs pay-TV channels. In order to make the most of those rights and to drive viewers to Katsomo, its online TV portal MTV3 decided to build an online, interactive TV service specifically for ice hockey fans. Rather than simply transferring the TV experience to the Web, MTV3 wanted to create an entirely new experience that took advantage of the Webs potential as a two-way communication platform and gave its viewers features they just couldnt get from traditional TV. 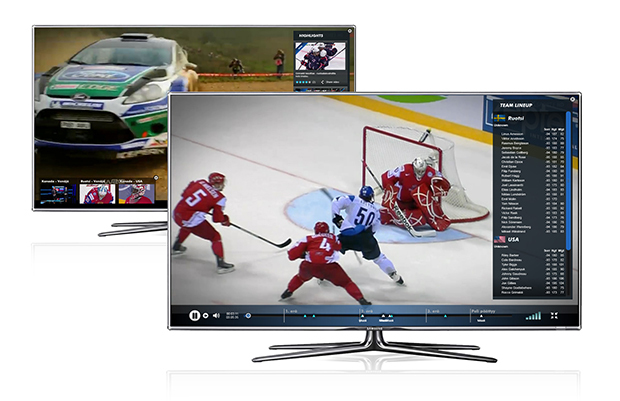 MTV3s goal was to create a completely new, interactive player for live ice hockey, which viewers would access via Katsomo. Anyone could subscribe to the ice hockey package, giving them access to a portal throughout the ice hockey season that housed an array of interactive services. Not only would subscribers be able to watch live or on-demand matches online, they could also switch camera angels to view additional perspectives of the game; chat with other viewers; publish comments to Facebook; review team statistics, match line-ups, and other facts; and much more. The biggest challenge MTV3 had in creating such a service was doing it on a very tight timeline. MTV3 started the process in February 2012 and wanted to launch the live ice hockey center in time for the 2012 Mens World Ice Hockey Championships starting May. Thats not much time under any circumstances, but especially not for the feature-rich, hockey-specific portal MTV3 envisioned. To make it happen, we worked closely with MTV3 to shape the experience in an effective way without sacrificing on the richness of the end-result. Thankfully the Vimond Platform was already in place at MTV3 to drive the Katsomo portal, and because of that, MTV3 was already using Vimonds APIs to build services on top of the Vimond Platform. With that setup in place, the foundation for the new ice hockey center was set. From there MTV3 could work to implement the ice hockey centers many features. However, the process of building a service with APIs usually takes months time MTV3 didnt have. To meet the stringent deadline, MTV3 relied on the Vimond Player framework and our open SDKs, which are designed specifically for a rich and engaging player experience. The framework acts as a layer between the APIs and the portal, tying everything together and enabling programmers to create rich experiences for sports fans in weeks instead of months. The framework contains a library of features that are already implemented on Vimond APIs, so instead of having to build the site from scratch and figure out how to implement all of its features, MTV3 could quickly and easily build the portal exactly the way it had imagined. MTV3 I very innovative and the ice hockey Web portal is as innovative as the technology thats driving it. Not only is it one of the first live ice hockey portals in Finlands advanced WebTV market, but it also has rich interactivity and social dimension that truly sets it apart in the region. Very few other services in Finland or beyond offer the ability to view multiple screens and angles. Broadcasters receive many camera feeds from sports-content providers, but on traditional television they can only show one at a time, so viewers can only see the feed the broadcaster chooses to run. With the live portal, however, MTV3 can stream all of the feeds at once, and viewers can choose which feed they want to see at any time. The MTV3 live ice hockey center has lived up to MTV3s vision and has certainly helped it maximize its rights. Now MTV3 not only has a new way to engage viewers and build loyalty, but also a new revenue stream as well. The portal garnered more than 20,000 subscriptions during the first season, enabling MTV3 to take full advantage of its ice hockey broadcasting rights. And because the whole service is built on a sports-specific development framework, MTV3 programmers have a way to produce services more quickly than ever before, making it quick and easy to expand the portal as needs change and viewing habits evolve.